For quickest response you may contact us regarding your gun safe questions by calling toll free: 866-723-3163 or use our Contact Us Quick Quote form below. 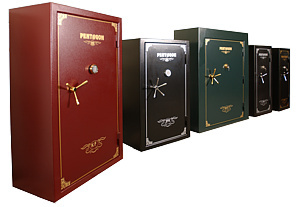 We can custom build any safe, security shelter or vault door to your custom specifications. Call us toll free to talk with one of our experts about your specific requirements. We Beat All Competitor's Pricing. Call Us and Find Out How. Copyright © 2013 Pentagon Safes. All Rights Reserved.